Rogue River Spring Chinook Salmon are likely the best of all Chinook Salmon to eat. 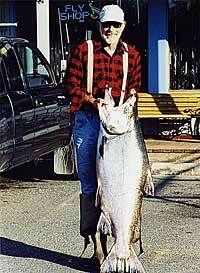 Spring Chinook enter the Rogue and fishing begins when they are just hours out of the Ocean. Oregon Fishing for Spring Chinook is best during spring runoff and snow melt in the spring of the year. April through June are best fishing time frames for Rogue River Spring Chinook. Most are caught only hours after entry in the cool springtime water flows of the Rogue River. The best opportunity to catch Rogue River Spring Chinook Salmon is April thru mid June on the Lower Rogue near Gold Beach Oregon. Starting in late March at Gold Beach Oregon and extending upriver 35 miles through June when the flows drop and water temperatures rise. By late May early June good numbers of Springer’s will arrive in the cool waters of the Upper Rogue near Medford and Shady Cove and this Oregon fishing trip opportunity will continue through July in this area with June early July being the peak of the Springer run on the Upper Rogue. Oregon Fishing and Salmon Fishing in particular go together and the Rogue River is home to thousands of mighty Fall King Salmon. Fall King Salmon fishing in Southern Oregon is a Northwest tradition going back 150 years for settlers and a thousand years for Native Americans. Early July is the startup of fishing for our Rogue River King Salmon. In August 2002 a 66-pounder was landed while trolling in the river estuary area at Gold Beach Oregon. This was the largest King Salmon landed in Oregon in nearly 20 years. This catch of a 66-pounder was soon eclipsed by a true Rogue River monster size Oregon King Salmon. Nearly all of the Rogue River Salmon fishing is for wild salmon stocks, very few hatchery Fall King Salmon are found in the Rogue River. Salmon fishing is good here until mid to late October. The Lower Rogue River near Gold Beach is the best bet for salmon fishing until water temperatures start to cool in September. Cooler weather in September brings water temperatures down encouraging stacked up King Salmon to begin to move up-river toward their spawning grounds up to 150 miles away. By September Rogue River Fall Salmon are being caught in the Grants Pass area of the middle Rogue and all the way back down the river to Gold Beach, Oregon at the mouth of the river. Best bets for Rogue River Steelhead fishing near Gold Beach occurs in the lower 35 miles of the river. Great Winter Steelhead fishing is available to both bank fishermen and boat users. For Steelhead Bank Fishing the style used is nearly all plunking and is met with great success from gravel bars at Ferry Hole, High Banks, Coyote Bar, High Banks, Huntley Park, Lobster Creek, Dunkleberger Bar and Squaw Bar. Boats are either Jet Boats which will anchor on inside corners with plugs in shallow water or drift roe from Drift Boats in the Agness area 30 to 37 miles upriver. Huge numbers of winter Steelhead surge into the Rogue River daily, making there way up the shoreline many times in no more than 2 foot of water. Hard moving winter Steelhead will avoid deep heavy water to conserve energy for their 150-mile journey up stream to the Middle and Upper Rogue River to spawn. 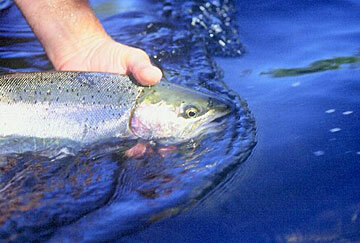 Estimates of 125,000 to 200,000 returning Winter Steelhead, of these less than 10% are hatchery origin. Rogue River Country is the Oregon Fishing destination for very rich Summer Steelhead Fly Fishing opportunities. The home to more Summer Steelhead than anywhere else on earth. Famous Summer Steelhead rivers located here are the North Umpqua east of Roseburg Oregon, the Rogue River from Gold Beach Oregon to above Shady Cove Oregon has 160 miles of top Summer Steelhead fly fishing waters. Summer Steelhead come in a variety of sizes and may migrate to the Ocean to rear for as little as 3 months or as long as 3 years and complete multiple spawning runs, as Summer Steelhead return to the sea after spawning. The Rogue River and Klamath River have “Half-Pounders”. The name “Half-Pounder” means little in describing the size of these dynamic Steelhead which run 1 to 3 pounds and are readily caught by fly fishing methods. Extremely active and aggressive, these silver rockets are a treat to catch on light tackle and fly rods. Making great sport Fly fishing with light line. The Chetco is a small coastal river about 50 miles in length located in far Southern Oregon, just 7 miles North of the California state line. Are river loved for its beauty and great runs of Fall Chinook. The Chetco River is fishable after October rains begin until it closes the end of March. With great bank fishing access and easy drift boat fishing it is one of the states best Fall Salmon and Steelhead Rivers. The Elk River at Port Orford is also a small coastal river of about 50 miles in length. The Elk River has a higher gradient and rocky stream bed with limited bank access to good fishing hole or runs. Drift Boats access the river very well and the river clears quickly after rain events. Like the Chetco River the Elk River season begins with significant October rain events and Fall Salmon and Steelhead fishing continues until the river closes the end of March. A truly great Oregon Fishing river. The Sixes River is just 2 miles north of the Elk River and again is about 50 miles in length. A lower gradient river than the Elk River and it tends to clear more slowly than does the Elk River or the Chetco River. Fall Salmon fishing begins after first hard fall rains but closes earlier at Jan 1st for salmon. Winter steelhead fishing continues until the end of March as do the other two small coastal rivers. Both the Coquille River and the Coos Bay Estuary are large tidal estuaries with miles of water to fish for Fall Chinook and Coho / Silver Salmon beginning the 1st of September and running through October or later. Both estuaries are also great Dungeness Crab fisheries. Both have great hatchery programs to augment good numbers of wild fish which bolsters catch rates. Bank access is better at Coos Bay Estuary for Salmon fishing. The North entrance to Crater Lake National Park is only a few miles from Diamond Lake, the headwaters of the Umpqua River. Located at about 5000 foot elevation on Oregon Highway 138 Diamond Lake offers the states beat trout fishing in spring and summer months and snow sports in the winter months. Nestled between the Cascade Mountains of Mount Bailey at 8,700 foot and Mount Thielsen at 9,185 foot. The Lower Umpqua River Spring Chinook run is high quality with fishing best just above tidewater below Elkton Oregon. The Umpqua River has high quality Chinook Salmon in the spring months coupled together with beautiful river scenery and the legendary Umpqua River history. It is said that the North Umpqua is a fly fishing graduate school. The North Umpqua is a tough place to get good grades. The North Umpqua has the most beautiful scenery and Fly Fishing waters fishing in the nation. Steeped in fly fishing history, home to Zane Grey, if only the pools and riffles could talk. The North Umpqua Highway follows the stream up into the Cascades from Roseburg to Glide, then on to Steamboat, the heart of the North Umpqua Fly Fishing waters. Across the river on the south side the old Cornel Mott trail will give access for Fly Fishing the south side of the river for about 5 miles. A good place to start a Oregon Fly Fishing trip on the North Umpqua is with one of our member Oregon Fly Fishing Guides with local Oregon fly fishing knowledge. One of the best Oregon fishing rivers for Winter Steelhead with a robust hatchery Winter Steelhead program. Best time frame February and March. Located near Canyonville, Oregon on I-5. The main Umpqua River is one of Oregon’s top Small Mouth Bass and Shad fisheries. The prime area is located below I-5 to below Elkton, Oregon on Hwy 58 to the coast. Best time frame is June thru August. Great family fishing trips with lots of action so it hold little and big kids interest. Umpqua also has a great Fall Chinook fishery. The Umpqua River runs between Winchester Bay and Reedsport on the Southern Oregon Coast upstream through Scottsburg and Elkton and on to Roseburg at I- 5. The area between I-5 and the South Umpqua River confluence with the North Umpqua River is a great area for Umpqua River King Salmon fishing. Ocean Charters on the Southern Oregon Coast operate primarily May through October for King Salmon and Bottom Fish, Tuna and Halibut. Ocean Charters are available at almost all our larger ports – Brookings Oregon – Gold Beach Oregon – Bandon Oregon – Coos Bay Oregon near Charleston Oregon – Winchester Bay Oregon near Reedsport Oregon. Rich Deep Sea fishing opportunities abound off the Rogue River Reef and Northwest Rocks only 3 miles from Gold Beach Oregon. Known for Big Ling Cod and Black Snapper fishing. Limits are the norm. Charter Boats Skippers will go for Albacore when conditions are right. Halibut fishing is also available during set seasons. Crabbing is on most times. Contact one of our Ocean Charter Skippers for best local information.